- Printing speed control . - Plate cylinder length setting . - Printing parameter setting . - Operation parameter setting . - Production additive memorizing . - Malfunction alarm information . - Automatic control of unwind tension . - Automatic cutting and roll change . - Jointing surface sensing control . - Automatic control of infeed tension . - Automatic control of rewind tension . - Decreasing tension control . - Automatic cutting and roll changing . - Non-stop roll change . - Automatic product length counting . - Automatic control of outfeed tension . * All specifications, dimensions and design characteristics shown in this catalogue are subject to change without notice. * Above control system is suitable for rotogravure printing machines. Control components are provided according to customer's requirement. * Control systems for other printing machines are available. Contact us for further details. 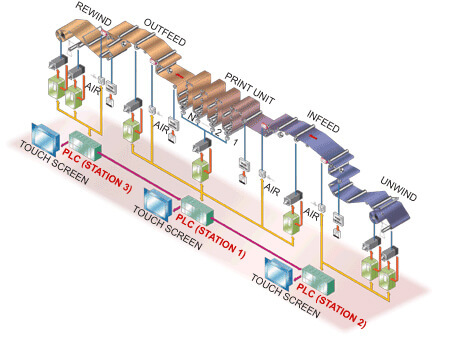 This is the detailed information for Rotogravure Printing Machines Control System. The information includes model, name, description and specification for Rotogravure Printing Machines Control System.